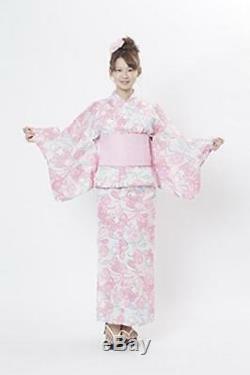 My Melody Women Japanese Yukata Kimono Obi Set Pink New. Thank you for looking at my page. My Melody Women Japanese Yukata Kimono Obi Set Pink New Condition: Brand New Brand: SAZAC (Southwark) Set contents - yukata x 1, band x 1 [Size] and women's adult one-size-fits-all and adaptation Height: about 154 168cm - Length: about 163cm · shoulder width: about 33cm · Sleeve length: about 49cm · Sleeve length: about 67cm Specification and patterns: yukata / cotton red plum, Obi / cherry pattern containing hanger with a private bag containing [Material] yukata: 100% Cotton range: 100% polyester. North America Central America Middle East. North America Central America Middle East AU, NZ. Thank you for visiting my page. If you have a question, Please feel free to contact me. And If there is an item you are looking for in a Japanese item, please feel free to contact me. International Buyers - Please Note. The item "My Melody Women Japanese Yukata Kimono Obi Set Pink New" is in sale since Monday, March 13, 2017. This item is in the category "Clothing, Shoes & Accessories\World & Traditional Clothing\Asia & Pacific Islands\Kimono". The seller is "torurin" and is located in Kanagawa Japan.